Over the past few days there has been a noticeable reduction in Rose's level of skittishness. She even chose to park near me a few times and didn't startle every time I moved. Several times she has let Laura and I pet her without bolting. This is very exciting news. I hate seeing her so terrified of her humans and I hope she continues to grow trust that her humans will always do what's best for her. Secondly, I witnessed Rose eating some of Nahum's lettuce! Whenever we have salads, Nahum comes running. I have heard from other cat owners that their cat comes running at the sounds of opening a tuna can. Nahum knows the sound of the plastic bag the lettuce comes in and comes running! He can barely contain himself. Not being able to wait a second longer, he may even jump on the counter trying to get at it. It is rare for him to break the rules and set paw on the counter. 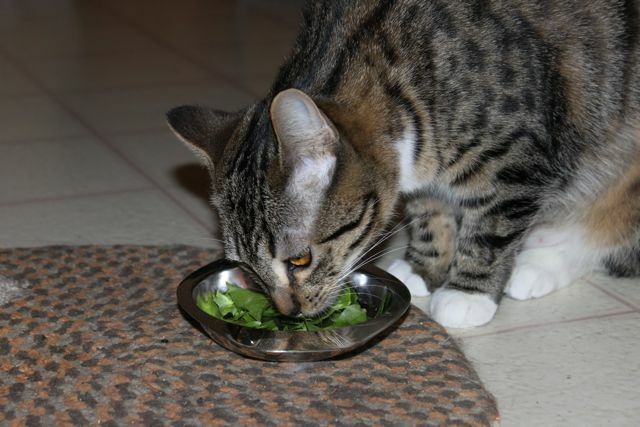 This time, Rose decided to eat a little greens. She didn't chow it down like Nahum but she certainly ate a few leafs! Willow is not quite as passionate about lettuce as Nahum but she does enjoy it. Theo won't touch the stuff - he looks at Nahum and Willow like they are crazy for eating rabbit food! Cats eating a salad? I have never heard of that. My cat Tiger eats banana. I thought that was odd enough. We'll have to try the salad. I imagine it could only be good for them. Your cats are beautiful! And your photos of them on the right side capture them very well. Hope you are ahving a good sunday.